The week of using what I have on hand continues, and I have to say, it's AMAZING what you can come up with when you have a bag of onions and bell peppers. *lol* And let's just talk about. Is there anything more delicious than sauteed peppers and onions? No, no there isn't. That is why I knew today's recipe was going to be a home run! 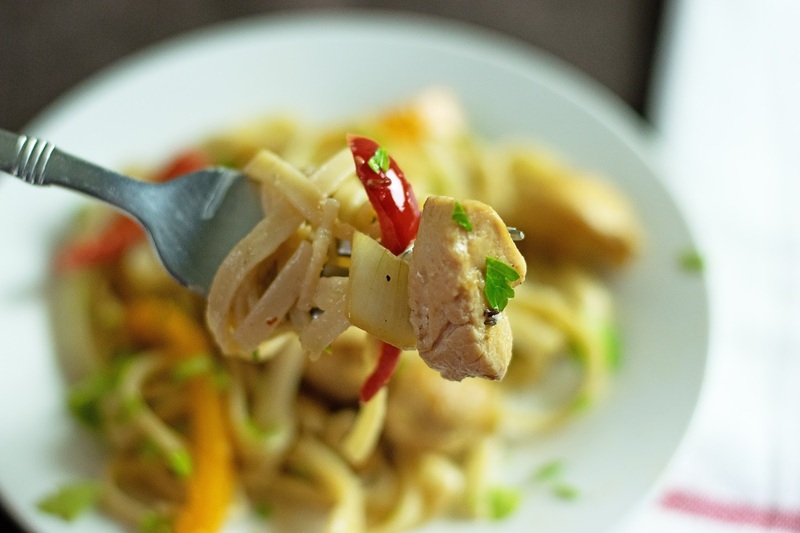 When you combine the deliciousness of peppers and onions with chicken, pasta, cream, and WINE, well you just can't go wrong! 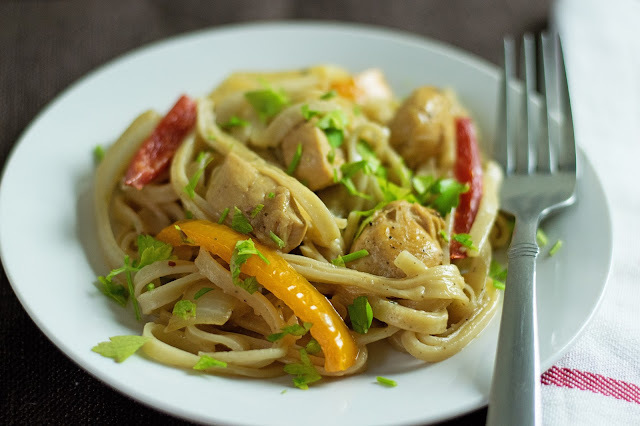 This Chicken Scampi is amazing and I know you are going to love it. To begin cooking, place a skillet over medium/high heat and add the butter and olive oil. When the butter has melted and the pan is hot, add the chicken. Cook until brown and no longer pink, about 5-6 min. Once the chicken is fully cooked remove from the pan and set to the side. To the pan drippings add the peppers and onions. Cook until the onions are translucent and the peppers are tender. Add the garlic, chili flake, and herbs. By this time the water should be at a rolling boil. Add the pasta and cook according the instructions on the box. Remove the peppers and onions from the skillet and set to the side with the chicken. Turn the heat under the skillet to high and add the white wine. Use a wooden spoon to pick up all of those delicious brown bits. Let the wine reduce by half. When I say reduce by half, I simply mean let the liquid simmer until there is half as much in the pan. This helps the alcohol cook out and the flavor intensify. Stir everything together, bring to a simmer, and let thicken. Return the chicken, peppers, and onions to the pan. Now you can add the pasta to the pan as well. Top with a little fresh parsley and give it all a toss! And there you have it! 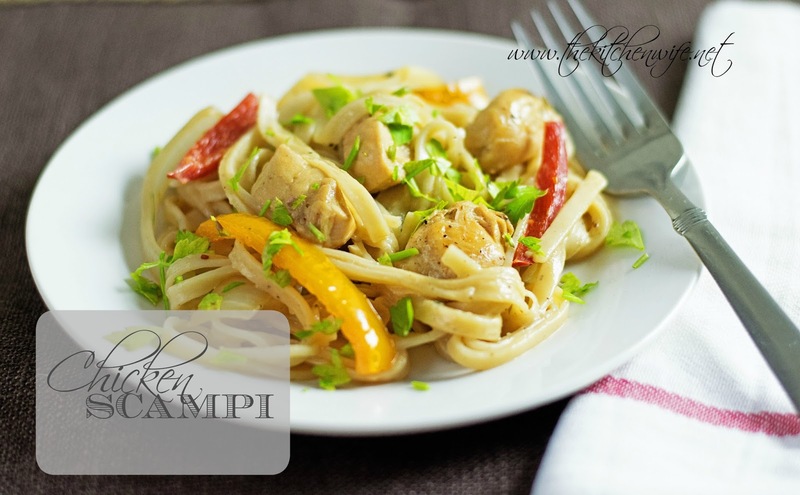 DELICIOUS Chicken Scampi, ready in minutes! Your family is going to go crazy over this dish, so get in the kitchen and make it tonight! Now pardon me while I dig in! YUM!!! Place a large skillet over medium/high heat. Add the butter and olive oil. Let the butter melt and the pan get HOT. Add the chicken to the pan and season with salt and pepper. Cook until brown and no longer pink, about 5-6 minutes. Once fully cooked remove from the pan and set to the side. Add the onions and peppers to the pan. Cook until the onions are soft and translucent and the peppers are tender. Add the garlic, chili flake, and herbs to the pan. Cook until you smell the garlic coming from the pan. Remove the peppers and onions from the pan and set to the side with the chicken. Turn the heat under the pan to high and pour in the wine. Using a wooden spoon scrape up all of those delicious brown bits and let it reduce by half. Taste for seasoning and make any adjustments. Add the chicken stock and cream. Bring to a simmer and let thicken. Return the chicken and vegetables to the pan. Toss and top with fresh chopped parsley.